With the help of our diligent and dexterous professionals, we are offering a comprehensive range of Disposable ESR Pipette to the honorable patrons. Designed & developed in complete compliance with the international quality standards & norms, these pipettes are widely used in the ESR (erythrocyte sedimentation rate). ESR (erythrocyte sedimentation rate) is a non-specific screening test that indirectly measures how much inflammation is in the body. Glass Agencies EROSE are manufacturer of ESR Pipette. - A single time use of the pipette-Westergren method. - It avoids mouth pipetting. - No additional vials, tubes or transfer pipettes necessary. - Highly-accurate, Reproducible, Risk free, Easy. - Efficient and Safe method of conducting an ESR. - Fibrous barrier protects user from hazardous aerosols. The new ASTRA "Easy-Rate" disposable ESR system allows a rapid execution of ESR as per "Westegren" method. E.S.R Westerngren Stand 12 Pipette. Maximum Volume Range: 100-1000 ul. This Graduated ESR Pipette is made of medical grade polystyrene, graduation up to 200 mm with self sealing air filter which prevent the over flow of blood. Simple, risk free, accurate and avoiding contamination. 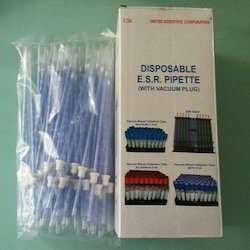 This pipette to suit all brand of blood collection tube and vacutainer.